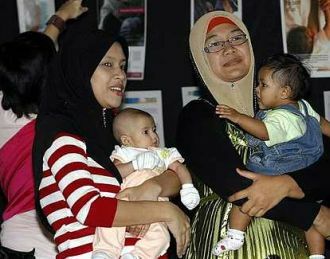 GEORGE TOWN: It was a joyous atmosphere when a group of 17 mothers gathered here to simultaneously breastfeed their babies for a minute in an event to promote breastfeeding. Their 40-odd family members sang “give your best to your baby, give your breast” to the tune of popular song “If you’re happy and you know it”. Another 158 mothers in the northern region also took part in the “One-Minute Simultaneous Breastfeeding” event which took place at 3.30pm. A mother’s love: Two mothers holding their babies during the event held at Disted College by the MMPS group in conjunction with the World Breastfeeding Week 2010. The World Breastfeeding Week 2010 event was organised by Mother-to-Mother-Peer-Support (MMPS) group at Disted College here yesterday. She said the programme was an international guideline for all maternity hospitals. “Among the 10 steps are helping mothers to initiate breastfeeding within a half-hour of birth and to give newborn infants no food or drink other than breast milk unless medically indicated,” she said in her speech at the event. Among the participants at the event were Tasha Lee, 31, and her two-month old baby girl Joey Tan. The mother of two said breastfeeding helped her to slim down after she gave birth. “After delivering my first baby, I lost the extra weight within six months. I was even fitter than before my pregnancy,” the yoga facilitator said. State Youth, Sports, Women, Family and Community Development Committee chairman Lydia Ong Kok Fooi said she could not breastfeed her two children many years ago as her body did not produce enough milk. “I hope to see more mothers breastfeeding their young as it benefits both the mother and the child,” she said.